4th century work by Wang Hsi chih Calligraphy is a system of aesthetic Chinese writing expressed through a variety of brush movements and compositions of dots and strokes. Largely unintelligible to Westerns, calligraphy is regarded by Chinese as "the supreme art form” higher than painting and sculpture and more able to express lofty thoughts and feelings than words. Fusing poetry, literature and painting into one art form, calligraphy was considered so important that ancient scholars could not pass their examinations unless they were masters at it. Good calligraphy possesses rhythm, emotion, aesthetic, beauty, spirituality and, perhaps most importantly, the character of the calligrapher. One ancient Chinese historian wrote: "calligraphy is like images without form, music without sound." From an early age Chinese children are taught that calligraphy and beautiful handwriting are reflections of their character and personality. Rendered in quick fluid strokes calligraphy is more concerned with flow and feeling than skill and precision and is supposed to come straight from the heart. The characters themselves are a kind of poetry. To produce great works calligraphers must tap into the forces of qi, which Taoists believe permeate nature and the universe. Most of works by famous calligraphers displayed in museums come from the eastern Chin dynasty, Tang, Sung, Yuan, Ming and Qing dynasties. Calligrapher at work Good Websites and Sources on Calligraphy : China Page chinapage.org ; University of Washington depts.washington.edu ; China Vista chinavista.com Brushes China Vista ; Calligraphy Masters on China Online Museum chinaonlinemuseum.com ; Chinese Painting: China Page chinapage.org ;University of Washington depts.washington.edu ; Chinese Painting Collection Blog chinesepaintingcollection.blogspot.com ; China Vista	chinavista.com ; Books: Chinese Painting by James Cahill (Rizzoli 1985). Possessing the Past: Treasures from the National Palace Museum, Taipei by Wen C. Fong, and James C. Y. Watt (Metropolitan Museum of Art, 1996). Wen C. Fong, Professor of Art and Archeology at Princeton, is the consultive chairman of the Asian Art Department at the Metropolitan Museum of Art in New York. Chinese Culture: Cultural China (site with nice photos cultural-china.com ; China Culture.org chinaculture.org ; China Culture Online chinesecultureonline.com ;Chinatown Connection chinatownconnection.com ; Transnational China Culture Project ruf.rice.edu China Research Paper Search china-research-papers.com ; Book: The Culture and Civilization, a massive multi-volume series on Chinese culture (Yale University Press). Unlike artists in the West who were either skilled craftsmen paid by the hour or professional artists who were commissioned to produce unique works of art, Chinese artists were amateur scholar gentlemen "following revered ancients in harmony with forces of nature." Calligraphy and painting were seen as scholarly pursuits of the educated classes, and in most cases the great masters of Chinese art distinguished themselves first as government officials, scholars and poets and were usually skilled calligraphers. Sculpture, which involved physical labor and was not a task performed by gentlemen, never was considered a fine art in China. Works of calligraphy and paintings were generally not painted on canvas like Western painting. They appear as murals, wall paintings, album leaf paintings, hanging scrolls and handscrolls. Hanging scrolls are hung on walls as interior adornments; handscrolls are unrolled on table tops; and album leaf paintings are small paintings of various shapes collected in book-like albums with "butterfly mounting," "thatched window mounting" and “accordion mounting." 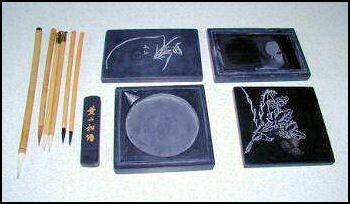 The tools and brush techniques for painting and calligraphy are virtually the same and calligraphy and painting are often considered sister arts. The traditional tools of the calligrapher and the painter are a brush, ink and an inkstone (used to mix the ink). Chinese calligraphers and painters both used brushes whose unique versatility was the result of a tapered tip, composed of careful groupings of animal hairs. Chinese calligraphers prized bamboo brushes tipped with hair from the thick autumn coats of martens. Many brushstrokes depict things found in nature such as a "rolling wave," "leaping dragon," "playful butterfly," "dewdrop about to fall," or "startled snake slithering through the grass." Natural terms such as "flesh," "muscle" and "blood" are used to describe the art of calligraphy itself. Blood, for example, is a term used to describe the quality of the ink. Calligrapher’s paper is still made by hand in some places by smoothing oatmeal-like pulp made of inner tree bark and rice and pressing and drying it. Poetry is much more fully integrated into painting and calligraphy in Chinese art than it is into painting and writing in Western art. There are two words used to describe what a painter does: Hua hua means "to paint a picture" and xie hua means "to write a picture." Many artists prefer the latter. Poetry, painting and calligraphy were known as the "Three Perfections." Poems are often the subjects of painting. Painters were often inspired by poetry and tried to create works with a poetic, lyrical quality. That calligraphy and painting are essentially the same. Other times the message of the calligraphy was more mundane. An inscription on the side of Sheep and Goat by Zhao Mengfu read: "I have painted horses before, but have never painted sheep, so when Zhongxin requested a painting, I playfully drew these for him from life. Though I can not get close to the ancient masters, I have managed somewhat to capture their essential spirit”. 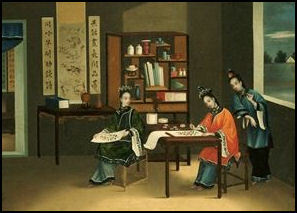 From their inception there has been a link between Chinese writing and art that does not have a counterpart in the West. Calligraphy has given Chinese poems, essays, letters and even official government documents a beauty that transcends the contents of what was written. There is no fixed relationship between the written Chinese language and the aesthetic beauty of calligraphy, but what is written with calligraphy does have meaning---and this relationship between the aesthetics of writing and meaning of the words is unique to Chinese calligraphy. The beauty of calligraphy is often described with imagery from nature. Sun Kuo-t'ing wrote in the Manual of Calligraphy, calligraphy can be "heavy like piled-up clouds, light like the wings of a cicada." If one leaves the writing alone "it flows like a stream, stop it and a mountain sits in majestic serenity." Sun Kuo-t'ing also compared calligraphy to human images calling it “a lovely maiden adorning her hair with flowers," with "full veins and flesh brimming with beauty." Some have compared calligraphy to music in terms of the speed and rhythms of the movements and the fluidity of the characters. Zong Baihua wrote in Aesthetics of Chinese Calligraphy: "Variations in density of composition, light and heavy strokes, slow and fast brushwork all affect form and content. It is like picking out notes from the myriad sounds of nature in musical or artistic creations, developing laws of combining those notes, and using variations in volume, pitch, rhythm, and melody to express images in nature and society and the feelings in one's heart." As is true with painting, one of the goals of calligraphy is to develop a calm mind, a cultivated memory. The characters, like objects of a painting, express reverence for nature and project a metaphor for the nobility of man. Cursive script There are basically five categories of calligraphy: seal, clerical, cursive, standard, and running. All five categories are still used today. The first examples of calligraphy are found on Shang Dynasty (1766-1122 B.C.) on oracle bones and bronze inscriptions. The writings that appeared on bronze vessels before 200 B.C. consisted of rigid, complex characters with many strokes. The complexity was reduced somewhat with the invention of seal script which was engraved on stone and on bamboo and silk. Seal script was the first form of calligraphy. Clerical script, which developed from seal script, was very complex and laborious to write. It was used mainly in official documents. A short hand form of clerical script known as "rough draft" script evolved into the cursive form. Before the Qin Dynasty (221 B.C.-206 A.D.) there were no names for script forms and calligraphy was referred to simply as "writing (wen) or "characters" (tzu). The first Chi'in emperor standardized the Chinese writing system, absorbing different regional forms, into "large seal script" (ta-chian) which was later simplified into more regular, flowing "small seal script" (hsiao-chuan). During the late Qin and early Han dynasties, "clerical script" (li-shu) evolved out of small seal script. Clerical script was characterized by simplified, squarer and more angular brush strokes. By the eastern Han period clerical script featured thickening and thinning brush lines, energetic slanting strokes, and wavelike forms. Running script Cursive style developed out of clerical style in the early Han period. It was preferred over other forms of calligraphy because it was easier and faster to write. In the late Han dynasty cursive style was simplified and standardized into smooth, flowing "draft cursive." The modern style of cursive in which many strokes were connected developed out of "draft cursive." The cursive script is the most abstract and culturally simple of Chinese scripts. Its natural fluidity and charm made it attractive to scholars for personal correspondence and artistic expression. Cursive calligraphy later developed into an art form that so captivated some of its practitioners they forgot to eat or sleep. Standard calligraphy, which slightly resembles clerical script, appeared in the late Han Dynasty (206 B.C.-220 A.D.) and early Wei-Chin (265-420 A.D.). Running script, a combination of standard and cursive styles, developed shortly afterwards. After the Northern and Southern dynasties (386-589), standard and running scripts were the most common forms of calligraphy, widely used in practical, everyday affairs. During the Tang dynasty (618-906), standard script prevailed and the methods and rules were firmly established so that Tang dynasty standard script became the model for later generations. During the Tang dynasty, calligraphers experimented with free, liberated forms of cursive script. In the Sung Dynasty (960-1279), calligraphers experimented with running script and developed a multitude of styles in which they expressed their ideas and feelings in their writing. In the Yuan (1279-1368), Ming (1368-1644) and Qing (1644-1911), calligraphers returned to the past for inspiration. 4th century work by Wang Hsi chih Pioneering calligraphers in the Han dynasty created styles that became models for later calligraphers. Wang Hsi-chih (Wang Xizhi AD 321-379), the Sage of Calligraphy, is often regarded as master of the flowing semi-cursive script. His original manuscripts were greatly coveted by a the 7th century Emperor Taizong who tired to obtain them by trickery from monk who was sworn to destroy them. One Tang Emperor so admired Wang's work he took the calligrapher’s famous Preface ro the Gathering at the Orchid Pavilion with him to his grave. Wang’s son Wang Hsien-chih (Wang Xianhi, 344-386) was also a great calligrapher. Wang Xizhi was reportedly inspired by the flight of geese: the bend of their wings, the curves of their necks and they way they held up before landing in a river. According to a well-known legend in China, Wang once met a monk with a flock of lovely geese. Wang offered to buy the geese but the monk refused to sell. After a log bargaining session, punctuated with arguments and tense words, the monk relented and told Wang he would trade the geese for two chapters of a Taoist scripture by Laozi in Wang’s calligraphy. After devoting an entire afternoon to the project, Wang finished the work and received the geese which one is led to believe he set free on a mountaintop. Chang Chih is regarded as the sage of cursive script. Chang Hsu from the mid-Tang period is famous for his "tipsy" cursive that provided an alternative to the classic style of Wang His-chih. Whenever Chang painted when he was drunk it was said that his brushes flied and danced with unbridled emotion. Huai Su was even less restrained than Chang Hsu. He was famous from his extremely fluid and spontaneous "wild" cursive. 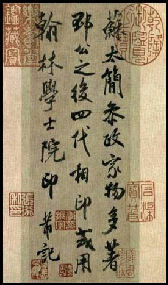 Chu Yun-ming, a very emotional and extroverted person, stressed the emotive side of calligraphy. The Qing calligraphy master Wang To is known for his skill in numerous styles and his attention to detail. Hand scroll Dizhuming by poet and calligrapher Huang Tingjian from the Song Dynasty (960-1279) was one of the most hotly pursued items. It finally sold for 436.8 million yuan at Poly's spring sales to an undisclosed buyer, the price far beyond the expectations from both the auction house and collectors alike. The sale set a new record for any genre of Chinese work - from antiques to contemporary pieces, almost doubling the previous high of 230 million yuan ($34 million) for a piece of blue and white porcelain from the Yuan Dynasty (1279-1368), which sold at Christie's in London five years ago. The 15-meter-long calligraphic hand scroll, Dizhuming, was completed in 1095. The original length of the hand scroll was 8.24 meters, but was then extended to 15 meters over the span of 800 years as its collectors, including prominent ancient Chinese scholars and royal court officials, added additional inscriptions to the piece. Six Chinese classic paintings and calligraphic works each selling for over 100 million yuan. Temple in Mountains in Autumn, a landscape painting by Yuan Dynasty artist Wang Meng was sold for 136.64 million yuan ($20.1 million). Hand scroll painting Mount Yandang by Qing Dynasty (1644-1911) painter Qian Weicheng went under the hammer for 129.92 million yuan ($20 million), five times its former record price of 24.08 million yuan ($3.5 million) at China Guardian's 2007 spring auctions. Not only people from auction houses, but also many experts see the record-breaking prices as a good thing for the Chinese art market, saying there is still a large gap to be filled in terms of catching up with the international scene. Like Chinese characters, each square English word is the same size, no matter the number of letters. The English letters are like the parts of Chinese character, and the writing sequence is from top to bottom, and left to right, following the path of Chinese characters. "Culture can stimulate the development of society. I'm not changing Western culture, but promoting a Chinese thinking pattern. It's easier to promote Chinese calligraphy among foreigners too," he said. Since 2008, his works have been exhibited in such places as Beijing, New York City and Las Vegas. He spent about a month finishing the work of the Charter of the United Nations in square English, which was collected by the UN in 2008. He also wrote the works of English versions of Chinese classical poems, prose and novels. "It's neat, pretty and saves paper. For the UN Charter, there are 117 pages in the English version, 95 in Chinese, but only 80 in square English," he said. He said the calligraphy could also be promoted in other languages such as French and German. "It's very creative. If the special calligraphy is promoted to the world, so is Chinese culture," said Gu Xiangyang, a calligrapher and professor from Peking University. Deng said the writing of the 26 letters remains pretty much the same as in English, but they are assembled in different ways to make the words diversified. Square English follows English grammar, too. For example, capitalized words in English remained capitalized. In addition, Deng divides the words by syllables and writes one after another according to the writing sequence of Chinese characters. "It's easy to pronounce the word when one sees the divided syllables, especially for Chinese, who are used to the top-to-bottom and left-to-right thinking pattern," he said. After years of research, Deng has created about 8,000 words in square English, each of which has a fixed form. If he has to write an unfamiliar word, he will first make a draft, to think about the perfect structure of the word. Deng said the idea struck him when he first came to the United States in 1997 as a visiting scholar. "My English was so poor that I even had difficulty reading the street names. If I could combine English and Chinese languages, I thought maybe it would be easier to learn English," he said. At first he scrambled the letters so that the words looked beautiful, but even Americans couldn't understand them. After numerous failures, he found the right way to write the English calligraphy in 2003. "For Westerners, square English is art, while for Chinese, it's a new and fun way to learn English," he said. He said a square English dictionary will soon roll off the press in Hong Kong and the Chinese mainland. The dictionary has more than 8,000 common English words, with Chinese explanations and Chinese pinyin. He has joined with the Chinese telecommunications giant Huawei Technologies to produce square English typewriting software, which will come out in a year or so. One only has to type the first and last letter of a word, and a list of words will pop up to choose from. "It's easy to type and avoid mistakes, as you don't have to type all the letters to get the word. People will love it," he said. Apart from square English, Deng leads a productive life of inventing with more than 160 patents under his belt, about half of which have been brought to market. He is also adept at both oil painting and Chinese ink-and-water art. His inventions of a wide variety include an anti-fake liquor bottle that can't be refilled, a wine made of vegetables and herbal cosmetics. "He is such a versatile inventor and generous about sharing his creations. He doesn't invent for money, but out of interest," said his friend Shen Jie, a member of China Association of Collectors. Deng said many of his patents have been violated by companies, who stole his formulas in the name of cooperation. "But I don't bother to file lawsuits. As long as the public benefits from these inventions, I'm happy," he said. Text Sources: Palace Museum, Taipei, Metropolitan Museum of Art, New York Times, Washington Post, Los Angeles Times, Times of London, National Geographic, The New Yorker, Time, Newsweek, Reuters, AP, Lonely Planet Guides, Compton’s Encyclopedia and various books and other publications.